The Egyptian military has issued a 48-hour deadline for the government to “meet the demands of the people” a day after millions of protesters swelled Egyptian cities calling for President Mohamed Morsi to step down. “The Armed Forces repeat the call for the people’s demands to be met,” said Defence Minister Abdel Fattah Al-Sisi in a speech carried on local radio. “Wasting more time will lead to more division and conflict,” Al-Sisi said, adding that “The national security of the country is in danger”. Al-Sisi’s ultimatum includes imposing a military-supervised road map if no resolution is reached by Wednesday. The defense minister said the imposed deadline represents “the last chance” for all the parties to meet the demands of the people and resolve the crisis. 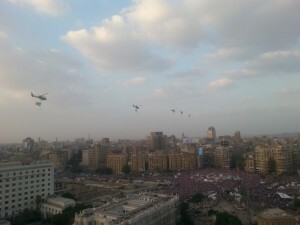 The statement by Egypt’s Armed Forces appears to have roused the spirits of protesters in Cairo’s Tahrir Square as they cheered military helicopters flying overhead. “I think we can safely argue now the Muslim Brotherhood rule of Egypt has come to an end since the army has given them a 48-hour ultimatum to quit. So we are in front of a soft military coup d’état,” says Rasha El-Ibiary, assistant professor and researcher in political communication at the American University in Cairo. “The situation now really depends on the determination and persistence of the Egyptians in the streets – the more they insist on self-rule and real democracy, to achieve the revolution’s initial objectives that were never met: ‘bread, freedom, social justice and human dignity’, the more they are likely to get them,” she added. In the meantime, Egyptian media reports quoted a cabinet official who revealed that four members of the government had resigned in protest at Morsi’s failure to respond to nationwide demonstrations against his rule. On June 30, millions of anti-Morsi protesters demonstrated in dozens of cities and towns throughout Egypt. According to the Ministry of Health, 16 people were killed and dozens injured in clashes between Morsi supporters and the protesters, including violence outside the Muslim Brotherhood headquarters in Mokkatam. The military had last week announced that it would not allow such violence to continue. Omar Shoeb, former producer of TV news talk show Baladna Belmasry, believes that most Egyptians do not want to see the army back in power but do want the military to “see us through” the transition after Morsi’s government steps down. “With the lack of a clear central command and leadership for this revolution, it is only natural that the only powerful patriotic entity, the army, would side with the people and see their demands through. If the revolution had a council of elders or leaders who can translate demands into action then we wouldn’t have needed the army’s interference,” Shoeb told The BRICS Post. 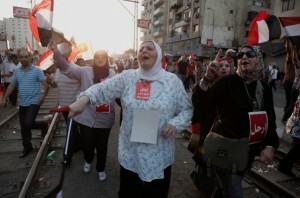 Shoeb believes that the military does not have any interest to take control of Egypt again (February 2011-June 2012). For his part, Morsi has asserted on several occasions that the army’s only role is to preserve national security, expressing reservation over military intervention and insisting that he could only be removed through the ballot box. However, the office of the Presidency cancelled a press conference initially scheduled to address the day’s developments and the military’s announcement. But not everyone has welcomed the military’s threat of intervention, which some have described as a coup. Salma Hegab, a grassroots activist and revolutionary who has documented the Egyptian Revolution on her blog, says she remembers protesting military rule just over a year ago. “’Down With Military Rule’ still echoes in my ears,” she says. “The battle for bread, freedom, social justice, and human dignity will never stop until we [the protesters] achieve them … the Muslim Brotherhood, the Egyptian Armed Forces and the [former ruling party] National Democratic Party remnants will never lead us toward these goals,” Hegab added. As Egyptians awaited clarity on whether Morsi will agree to establish a presidential council, draft a representative constitution, and allow for elections leading to a representative people’s assembly – points Shoeb says form the crux of the protesters’ demands – social media rumours focused on the military’s seizure of the Television and Radio building in Maspero, and the airport. Speculation is rife, says Rania Al Malky, editor of the Egypt Monocle news portal. “The army has basically given Morsi a 48-hour ultimatum to meet the ‘people’s’ demands, but the question is, which people?” she says.